With the Montreal Canadiens holding the 25th position in the nearing NHL Entry Draft, many fans might wonder if the Habs would try to trade up in the draft in order to secure themselves a more surefire prospect – especially given the gaping hole left in the cupboard by the departure of Mikhail Sergachev. Perhaps though, a more likely possibility would be the notion of the Canadiens trading down to pluck a later gem who has tumbled out of the spotlight and into bargain territory. Maxime Comtois could be such a player, a one-time Top 15 prospect who has since descended considerably down most rankings, due to a disappointing sophomore season in the QMJHL. Nevertheless, his size, work ethic and hockey sense could place this local boy on Trevor Timmins’ radar as a ‘buy low’ opportunity. Maxime Comtois entered the 2016-17 season with high expectations all around. Hot on the heels of a tremendous, point-per-game rookie season with the Victoriaville Tigres and a fantastic showing at the Ivan Hlinka tournament, many had pegged the versatile forward as a potential Top 15 or even Top 10 pick in the 2017 entry draft. Sadly for Comtois though, he stumbled out of the gate this season and struggled mightily to find the scoresheet in the first three months of 2016-17 campaign. He also failed to show improvement in his skating, which had previously been noted as an area of concern. Nevertheless, there remains some reason for optimism surrounding Comtois, despite his regression in the stats column. Comtois’ lacklustre point totals (51 points in 64 games), were largely the result of his early season struggles, but he picked up his game considerably in the second half, producing at nearly a point-per-game pace from December onward. While his offensive game lacks flair and creativity, Comtois does boast good vision and playmaking abilities, as well as a heavy shot. Even more noteworthy for fans of the Montreal Canadiens, is the fact that Comtois’ increased second half production resulted from his move from the wing to centre; almost the antithesis of an Alex Galchenyuk situation. While Comtois struggled to find the back of the net, his work ethic was never in question. Knowing how important character and work ethic are to the Canadiens’ brass, this point could be of high consideration. He is projected to be a top-9, two-way forward, which speaks to his responsible play on both sides of the puck. In short, this is a player with some size, who has excelled at the centre position and is a proven hard worker – and he happens to hail from the preferred province of the Canadiens. All of these factors combined could be enough for the Canadiens to consider taking a flyer on a player who could end up being a diamond in the rough. Should the Canadiens elect to take a chance on Comtois, his timeline for cracking the NHL lineup will be far from immediate. 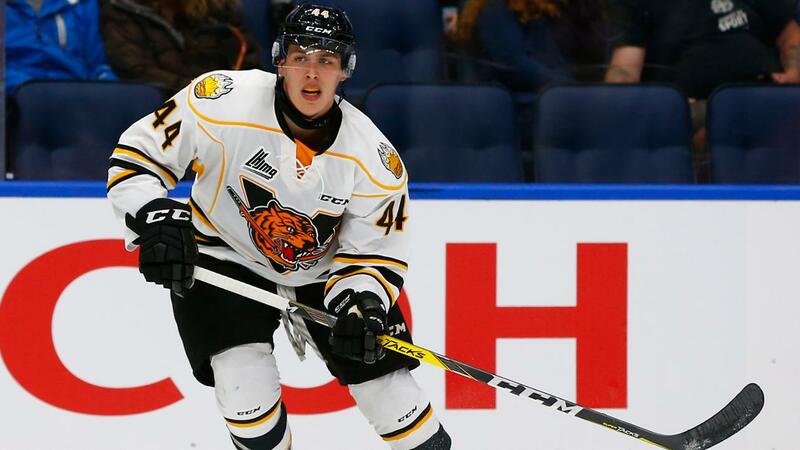 Not only do the Canadiens like to take their time with their prospects, but Comtois would find himself in line behind the likes of Michael McCarron, Charles Hudon, Nikita Scherbak and possibly even Daniel Carr or Chris Terry. The Canadiens would likely play it very patiently with Comtois, working with him to regain his confidence and scoring touch and hopefully improve his first step and overall speed. Maxime Comtois would represent the very epitome of a project player, but could be a very intriguing one, should Timmins and company find themselves in a gambling mood. He would likely need another two more years in junior, followed by at least 2-3 seasons in the AHL.